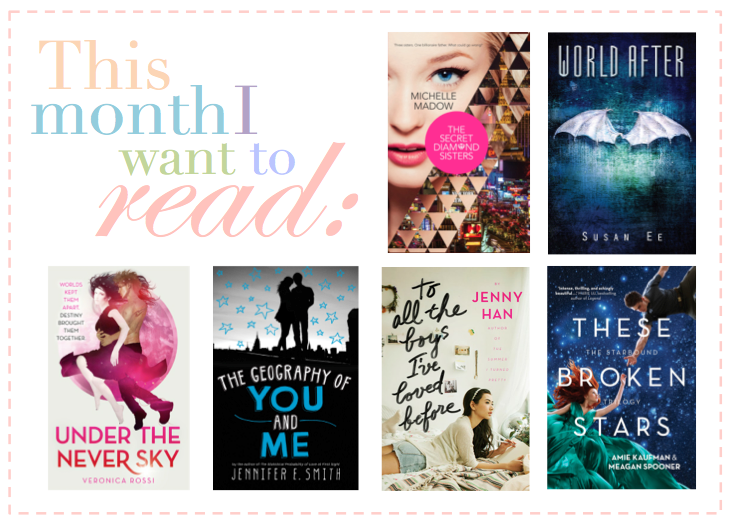 The Girly Geek: April TBR! I'll be on my two week Easter holidays this month and I'm planning on dedicating that time to catching up on some reading. I feel like I've really been slacking with my reading these past couple of months with school and life getting in the way, but I'm determined to make that change! I started reading this book late last month and I really enjoyed the first few chapters. I think this book will be a really fun and entertaining read! So far it feels like something along the lines of Gossip Girl, filled with fame, fortune, drama, boys, gossip, and the inevitable family conflicts. I'm really looking forward to seeing how this book plays out! Once again, I started reading this book in March and I'm really looking forwards to finishing it! I read the first book in the series, Angelfall, last month and I absolutely loved it! I can't wait to see how things continue for Penryn and Raffe. I can already tell that this is going to be an incredible series! I've owned this book for almost a year now and I've never gotten around to reading it! I think I can vaguely remember reading the first two or so chapters but of course getting distracted and reading something else. I've heard some really great things about this trilogy from friends and I am so excited to dive into this world! I read Jennifer E. Smith's other two books, The Statistical Probability of Love at First Sight and This is What Happy Looks Like last year, and really enjoyed them. I thought they were really quick and sweet contemporary reads to get me out of reading slumps. This book is coming out later this month and I think it's going to be just as good, if not better, than the first two! The premise of this story sounds INCREDIBLE. Even the title gives me goosebumps. Ever since I heard about this book I have been living my life in anticipation of its release! Only a few more weeks now! I read Jenny Han's The Summer I Turned Pretty series two years ago and I really loved them. They were such heartwarming books. I cannot wait for this book. I need it in my life now! I've heard some really promising things about this book from a friend recently and I am desperate to read it! I think the synopsis of the book is really intriguing and will really appeal to my love of young adult sci-fi novels. And Marie Lu, author of the Legend Series reviewed it and had some stellar things to say about it! I'm so excited!